I'm not a marketing guy, I neither have requested advices from my marketing guys friends...I did it all my way and that's why my brand new Chrome Extension will be forgotten in days! Once upon a time there was a simple Chrome Extension I made at work for WebResults, my Company: you will hear about it in weeks, but not now. After weeks of testing we decided to put it in the market but I didn't now how to do it (I know, there si plenty of stuff online, but I don't trust myself till I see things done!...that's why because sometimes I behave like Goofy when dealing with simple tasks!!). So I thought, "How can I do a clean job for my company without making foolish mistakes"? The answer was "Create your own extension". That's why I created url.enree.co (I love this domain name), a simple Url packing utility hosted on Heroku, written in NodeJS. Why not creating a simple chrome extension to use this service? 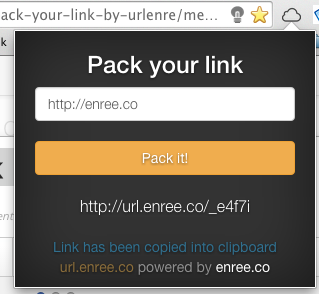 Here you are Pack your link by url.enree.co. Publishing a Chrome Extension on the store is really easy. Go to the Chrome Store Developer dashboard: you have to pay 5$ to be able to publish your creations on the store, once in a lifetime! In few minutes you'll be allowed to publish extensions and apps. ZIP your local extension's folder and upload it: it seems that you cannot remove a product once uploaded (read more details here, but I'm not quite sure about it), but you can still unpublish to hide it.